The former Republican senator has an independent streak that unsettles Republicans, and even some Democrats. There is no worse place than a Senate confirmation hearing to get a sense of whether a nominee for a critical cabinet post is up to the job. Chuck Hagel proved that Thursday, delivering a predictably cautious opening statement at the Senate Armed Services Committee hearing on his nomination to serve as President Obama’s secretary of defense. The questioning—from Republicans who now appear to despise the former Republican senator from Nebraska (including the ungrateful recipient of Hagel’s 2000 presidential endorsement: Arizona Senator John McCain) and from Democrats who are still wrapping their head around the idea of Hagel as a member of the Obama cabinet—was only slightly more illuminating. But there is nothing drab or predictable about Hagel. There’s a reason neocons and military contractors are so determined to block his confirmation. Hagel’s shown an independent streak that is not just rare in Washington; it explains why leaders of both parties are so frequently unsettled by the former senator, and why it is really quite remarkable that Obama has nominated this Vietnam veteran to serve as the first-ever “enlisted man” secretary of defense. I don’t count myself as an enthusiast for Hagel on every front; I’ve still got troubles with his 2002 vote to authorize George W. Bush to take the country to war with Iraq, for instance. I know he will not be an ideal secretary of defense. I know he will disappoint at some point if he is confirmed. Probably at some point sooner than later. But Hagel is a rare political figure who evolves, and who admits his errors. And he is not afraid to call out those who lied to him along the way, and those who continue to lie to themselves. It bugs the John McCains of the world that, in a town where few prominent politicians ever come clean, Hagel went honest on them. And he did it at a point when a good many Democrats were still wrestling with the truth. I spent a good deal of time following Hagel in the period from 2003 to 2007, when he emerged as the Republican Republicans loved to hate, and as the Republican who showed Democrats that they could—and should—be much more critical of the Bush-Cheney administration and the Pentagon. Over the course of the past week, Nebraska Senator Chuck Hagel, a maverick conservative Republican from Nebraska, has scoured the administration for its misguided approaches in language far wiser and bolder than the empty stream of rhetoric that continues to pass the lips of his Democratic colleagues. Hagel is far from a perfect player. He doesn’t have all the answers. He’s not even proposing bold responses to the current crisis, and not all that he suggests is wise or responsible. The senator’s simply a throwback to the old bipartisan consensus that said diplomacy and common sense ought to guide US foreign policy, as opposed to messianic ranting and kneejerk reaction. Bush and his neoconservative colleagues are so out of touch with global realities and traditional American values with regard to diplomacy that they don’t even understand where Hagel is coming from. Unfortunately, the Democrats are so lacking in spine and vision that, while they may recognize that Hagel is right about the failures and false choices that are the byproducts of this president’s policies, they lack the guts to borrow enough pages from Republican senator’s playbook to make themselves an effective opposition party. 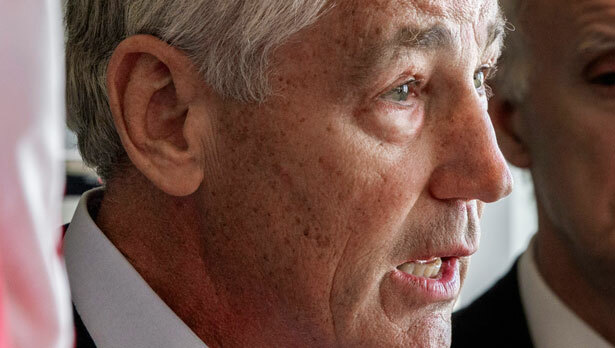 Read John Nichols’s primer on Chuck Hagel’s candidacy for secretary of defense.